My mother suggested Devil’s Den. Devil’s Den is, of course, an outcropping of rocks at (more or less) the base of Little Round Top. It used to boast supremely amazing bathrooms which, unfortunately, have since been removed due to battlefield reclamation or whatever they’re calling it these days. It’s a shame, really, since that’s inevitibly when I have to pee. During the battle, Devil’s Den was a hornet’s nest. There’s a notorious picture of the dead Confederate sharpshooter that may or may not have been staged. Nowadays, it seems to me Devil’s Den is regarded as a nice picnic area where people let their children climb, run around, and run amok with no disregard to anything. I almost got smashed in the face with a frisbee once. Don’t even get me started. I get awfully sassy about it. This is from like, 2001. In fact, I can actually tell you the exact date it’s from. August 25. It’s the day that I met The Hubs! 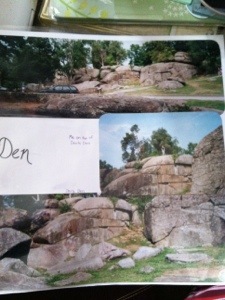 I can also tell you, Devils Den no longer looks like this. See aforementioned battlefield reclamation. If you’re looking for trees, there aren’t any. Anyway, Devils Den is not in my novel. The Hubs and I don’t even spend that much time there anymore. In February of 2003, I got oh, let’s say stranded, down there following a colossal blizzard. At this point in time, we’d been dating since September. Our Valentines Day dinner was scandalously and suspiciously ruined. So on the 15th, we went to Gettysburg. He was not amused. In fact, he wasn’t speaking to me. I took this as a sign he was about to dump me. Awesome! Ruined Valentines dinner. Blizzard. Dumped. The potential for frostbite! Even better! To which he responded by whipping out an engagement ring. We ended up getting married on his parents back porch, two days before he deployed overseas with the Army, but yeah. I still think it would be cool to get married there. Previous PostCorsets. How about corsets? Next PostElevator Snob and Editing Enthusiast: This is real life, kids. Ah i know about Devil’s Den. I used to be a huge Civil War buff. Thanks! I love hiking around Gettysburg. I think autumn is the best time, when it’s not quite as crowded and just a little cooler out. We’ve walked Pickett’s Charge several times and I think that might be one of my favorite parts of the field. Great proposal story. Very romantic in an offbeat, Civil-war-buff sorta way. Much more romantic than the way my husband proposed. He asked me as we were watching a television movie late at night. Well, he didn’t really ask me, he just said, “So are we getting married or what?” I thought he was kidding so I shushed him and said, “I’m watching this. Ask me at the commercial.” He did. I said yes. And two kids, and one mortgage later we are still together. I still shush him when we’re watching television. Aw, that’s actually kind of sweet! He never technically “asked” either. I don’t blame him for getting down on one knee, since we were in so much snow, but we were so comfortable with each other at that point, in my mind he didn’t have to. Does that make sense? We’re the same way though: two kids and a mortgage later, and we’re still cruising right along! I’ve missed you, Darlene! Hope all is well! Thanks! It’s such a tranquil place now; barely a shadow of the horror it was during the battle. My favorite time of year, other than the dead of winter, is in late fall when it’s starting to get cold and rainy. Hi Heather, glad your mum suggested this one. Enjoying your AtoZ’s. Thanks! It was a fun one to write, even though The Hubs was embarrassed I used him as a topic, yet again lol!